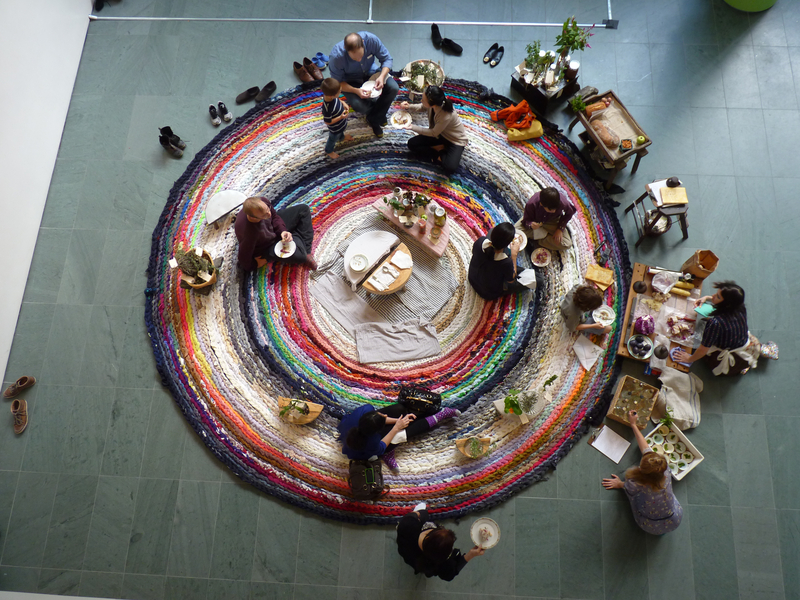 Over the course of four marathon days, the Los Angeles–based artist Fritz Haeg is working in the museum lobby with volunteers and museum visitors to crochet discarded textiles into the traveling Domestic Integrities rug. A display of edibles, medicinals, and herbals fresh from his Los Angeles garden, including offerings of produce and herbal tea infusions, is presented on the rug. Fritz Haeg. Domestic Integrities part A01: New York, 2012. Installation view at the Museum of Modern Art, New York. Photo by Jack Ramunni, Mildred's Lane. The rug of local textiles is a charged site for testing, performing, and presenting how we want to live. These spiral-stitched circular rugs gradually expand as they travel from city to city. The European edition traveled to Budapest, London, and Vienna before arriving at a yearlong installation at Pollinaria in Abruzzo, Italy. American editions started at Mildred’s Lane in Pennsylvania and the Broad Art Museum at Michigan State University, coming to the Hammer from the Museum of Modern Art in New York, before continuing to the deCordova Sculpture Park and Museum, Lincoln, Massachusetts; the Walker Art Center, Minneapolis; and the Berkeley Art Museum. Visitors may bring their clean discarded clothing, textiles, linens, towels, and sheets to contribute to the effort. The Hammer Museum’s Public Engagement Program is supported through a major grant from The James Irvine Foundation. Additional support is provided by Karyn Kohl.